"The Power of Two Working For You" - Selling homes on the Crystal Coast of North Carolina Since 2006. Larry and Virginia are partners in life as well as your Experienced Partners when it comes to buying or selling a home on the Crystal Coast of North Carolina. Being "Spouses Who Sell Houses" - we work together to make your home selling or buying experience an ease. 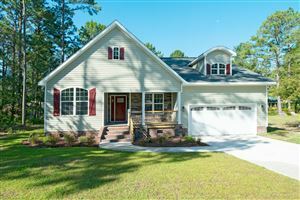 We are also your Trusted Resource for answers about the home buying & selling process on the Crystal Coast of North Carolina and all of Eastern North Carolina. We have lived in Emerald Isle for over 10 years and are happy to help others find their dream of living on the Crystal Coast of North Carolina. Looking for a Emerald Isle REALTOR®? We are your Real Estate Professionals serving Emerald Isle, Indian Beach, Pine Knoll Shores and Atlantic Beach NC. What do Real Estate Agents Do? We also offer Innovative marketing strategies for home sellers including wide internet exposure on Craigslist, Realtor.com & Zillow.com and more than 40 other websites. We are your neighborhood specialists and offer free local market information for both sellers and buyers! Be sure to Sign up for your FREE Market Insider now! We offer buyers the opportunity to search all properties on the Crystal Coast of North Carolina including Emerald Isle. Atlantic Beach and the Crystal Coast Beaches, Cedar Point, Cape Carteret, Swansboro, Morehead City, Havelock and New Bern with our free real estate listings. SEARCH NOW for homes for sale on our website! With strong negotiation skills to get you the right price for your home whether buying or selling, we are Military Friendly and experienced in Military Relocation when you are either buying or selling your home. Thinking about selling your home? We offer a detailed Seller Property Report for FREE! Included in this free seller property report are the most recent sold properties as well as what other homes in your neighborhood are up for sale. Find out how much your home is worth FREE! Thinking of renting your home? Leave the keys with us. From Annual Rentals to VRBO - We offer Homeowner Service Packages to fit all needs. View our annual plans now. Have a second home that needs a set of eyes on the Crystal Coast of North Carolina? We offer Home Checks for Second Home Property Owners on the Crystal Coast and surrounding areas. Find out more.